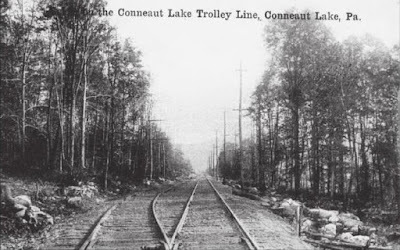 On May 30, 1906, the Meadville and Conneaut Lake Traction (M&CLT) Company formed with a goal of bringing trolley service to Exposition Park (Conneaut Lake Park today). A suitable route was agreed upon that would continue from where the tracks left off in Fredricksburg and then follow the general course of the Cussewago Road to Harmonsburg (vicinity of Routes 102 and 3016) before turning south, crossing the lake’s inlet, and entering the park along Comstock Street. 100 immigrant laborers, primarily Italians, along with two freight cars full of work horses were assembled and brought in later that summer to begin the arduous task of grading an earthen avenue, laying the 85 pound rails, and stringing the overhead electric wire. The work crew, however, wasn’t large enough, and the scarcity of additional labor seriously delayed completion, leaving initial expectations of reaching the park by December buried under the winter snows. 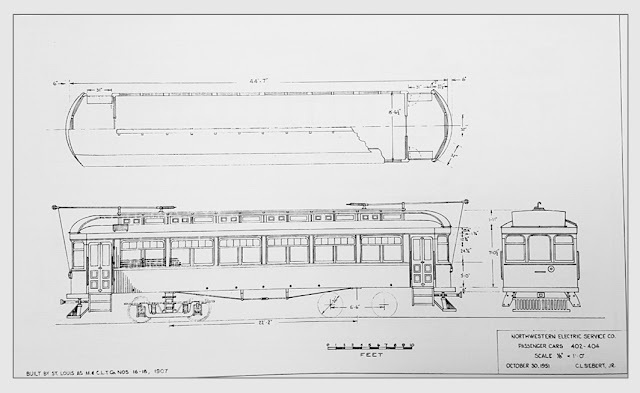 It wasn’t until July of 1907 that the line would be complete, but even then there was little excitement as the traction company had been hit with another setback when the five interurban cars ordered for May delivery from the St. Louis Car Company were still not ready due to a paint strike at the factory. The cars would not arrive until August 1st, and even then, they were not to Shryock’s original specifications. Among the most obvious mistakes was the misspelling of the intended route for car number 14, its green painted hull announcing “Hamonsburg” in large white letters. The trolleys remained on the railway flat cars for almost three weeks as Shryock dealt with the errors. It wasn’t until late September that they would be put into operation but not before additional supports had to be placed under the Mead Avenue Bridge for it to carry the weight of the interurban cars frequenting its span. In the meantime, however, the Conneaut Lake Fair was fast approaching, and with pressure mounting, Shryock relented to using the Meadville cars. To celebrate the traction company’s long forestalled achievement, local businessmen and the press, at Shryock’s invitation, climbed aboard a trolley for a ceremonial trip to Exposition Park under the late afternoon sun of August 16th. Once Motorman F. Pitts tugged at the controls, the car, festively decorated with eagerly waving flags and patriotic bunting, rolled into motion. 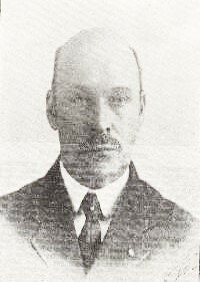 At this point Conductor John Geary treated riders to cigars provided by a relieved but somewhat chagrined President Shryock whose goal of a full summer’s worth of ticket revenue had been cut short by delays and mistakes. Among the riders was a reporter from the Meadville Tribune-Republican who filed a detailed if not pastoral account of the trip days later. Much of the route is over the company’s private right of way, with the few roads crossings well in view and unusually safe. It would be hard to find in all this section a more attractive route, in point of scenic effect. The country is rich all along the way, with good buildings, fine fields and forests, and just rolling enough between Meadville and the lake to make it interesting, while from Harmonsburg to Linesville it is practically level. Ticket prices were set at 15 cents for a one-way trip, and by the time the Fair began in the last week of August, the city cars from Meadville were in full operation. 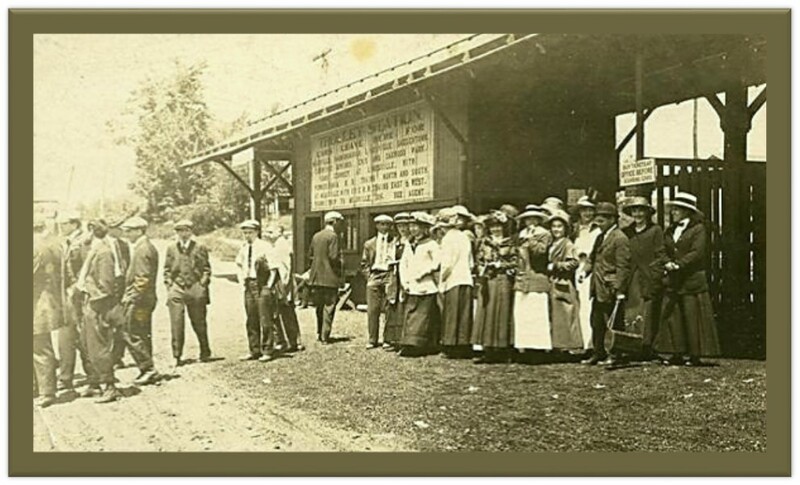 With this new mode of transportation available for the Fair, cars were consistently overloaded with eager passengers while loading stations were so packed with anxious crowds waiting to board, children in some cases had to be handed out windows in order to avoid being crushed. The interurban trolleys represented another means by which industrial advances were changing the landscapes—in this case literally—of rural communities. The intersection of this change was played out on a late summer afternoon in 1907 shortly after the Fair’s conclusion when passengers returning from an event found themselves the spontaneous participants in a thrilling race with a horse-drawn buggy that had overtaken their trolley. Goaded by such brashness, the car’s motorman attempted to close the gap, clanging of the car’s bell wildly, the sound of which only spurred the daring buggy driver to press his stead all the faster. The race evened, each now trying to nose ahead of the other as they crested the slope of Cussewago hill leading into Fredricksburg. A sharp turn near the bottom of the hill awaited them, and the motorman eased back on the brakes, slowing the car to a safe speed. The buggy driver, however, carried by the horse’s momentum, failed to negotiate the turn in time. The carriage flipped, throwing the driver and his female companion through the air and leaving the horse flat on its side. To the trolley passengers’ great relief, the young driver and his passenger were shaken but physically unhurt. The fate of the horse went unmentioned. 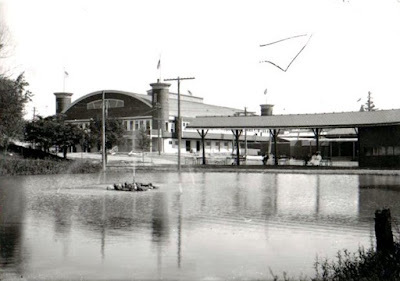 In June of the following year a more permanent passenger depot measuring 16 x 120 feet was built at Exposition on the north side of Reed Avenue behind the original Dancing Pavilion so as to handle the size of the anticipated crowds in the seasons to come. At the same time, to ensure a smoother operation without delays, the tracks were extended into a loop around a scenic pond with a fountain so trolleys could unload riders and continue on for a return trip to Meadville in one continuous motion. In May of 1917, fire ripped through the Meadville car barn at Chestnut Street, destroying 15 trolleys housed inside including cars 400, 401, and 402—three of the original St. Louis cars operated by the M&CLT Company which had since been reorganized as part of the Northwest Pennsylvania Railway Company. [See Note 1] Despite the loss, the line switched to a two-hour schedule for a time, but soon resumed normal operations once the cars were replaced, continuing like clockwork with service to the park for another decade with cars arriving every hour (a one-way trip took 40 minutes), only slowing in frequency as summer faded into winter and plows were added to push snow from the rails during trips. Financial difficulty became a common theme for the traction company as ownership changed hands frequently during the trolley’s lifetime. Eventually, though, this mode of travel too succumbed to irrelevance as paved roads, automobiles, and bus routes offered residents more convenience and freedom. 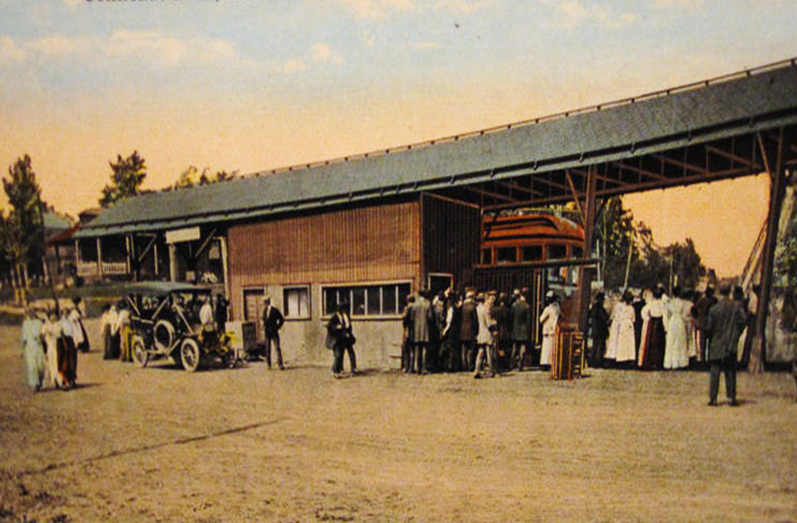 Despite ceasing city service in 1927, the Meadville station continued operating a single, hopeful car over the tracks to the since renamed Conneaut Lake Park, but the effort wasn’t enough to outrun the inevitable. 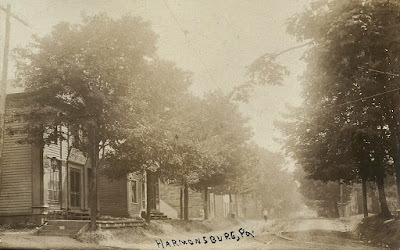 On a hazy, humid July 31st in 1928, a lone trolley made the last trip across the familiar rolling landscape, passing the increasingly newer buildings, seemingly smaller fields, and ever receding forests without fanfare. 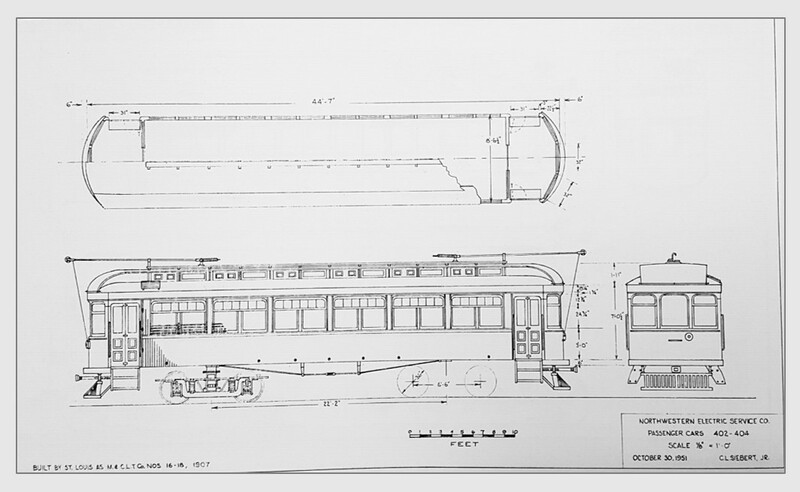 The St. Louis interurban cars were scrapped and taken to Edinboro to be converted into diners. [See Note 2] Soon thereafter a crew went to work tearing out the tracks. Among them was a recent high-school graduate, James Shryock, whose great uncle once refused to send nothing but the finest equipment over those rails to the park. Note 1: Originally numbered MCL Nos. 14 – 18, after the reorganization into Northwest Pennsylvania Railway Company, the cars were renumber as NWP 400 – 404. Cars 400, 401, and 402 (previously 14, 15, and 16) were destroyed in the fire, cars 403 and 404 (17 and 18) were kept in service until they were scrapped in 1928. Note 2: The Crossroad Dinor which is still open today, is not one of these cars, but rather NWP ar 103 which occasionally made trips to Conneaut Lake as well.